Abstract paintings that translate the visual world. In 2006, Treib received an MFA from Columbia University where she studied with Charline Von Heyl, and, previously, she has shown with John Connelly. I’m looking forward to seeing her new work. 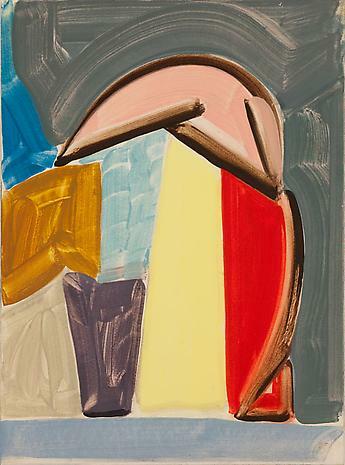 Patricia Treib, Correspondence, oil on paper mounted on board, about 15 x 11 inches. 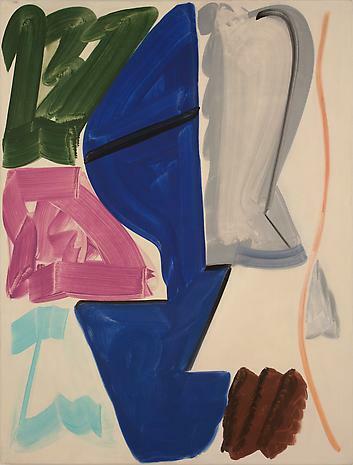 Patricia Treib, Garb, oil on canvas, 66 x 50 inches. The gallery is pleased to present an exhibition of new paintings and works on paper by Patricia Treib. The exhibition marks her first solo exhibition with the gallery. Treib will exhibit paintings that draw from the vicissitudes of perception through time. Made in one sitting, the paintings seek to bring about a feeling of simultaneity: the sensation that every act is happening at once in a continual present. The paintings are painted on the floor and are scaled in relation to the artist’s height. Treib is searching for an image that is not from a singular viewpoint, but includes and entertains the inconsistencies inherent in vision itself. For example, the type of disjuncture that is experienced everyday, but is smoothed over and made imperceptible through habit, which is the act of synthesizing the separate views from both eyes. The paintings are rooted in the physical disjuncture that is part of the body. Patricia Treib received an MFA from Columbia University in 2006. Her works have recently been exhibited at Wallspace in New York and Favorite Goods in Los Angeles. Treib had her first New York exhibition at John Connelly Presents and also had a solo show with Golden Gallery in Chicago. She has had residencies at Skowhegan School of Painting and Sculpture and the Marie Walsh Sharpe Foundation. Treib lives and works in New York.